7. New Study Sug­gests Many Knee Sur­ge­ries Are Un­ne­ces­sary /2014/01/new-study-sug­gests-many-kn..
8. Steep Decli­ne In Medi­cal Malpracti­ce Pa­youts Did Not Redu­ce Health Costs /2013/11/steep-decli­ne-in-medi­cal-m..
9. New Approach To Medi­cal Malpracti­ce Disclo­se Apologi­ze and Offer /2013/11/new-approach-to-medi­cal-ma..
10. Redu­cing Medi­cal Malpracti­ce From Com­munica­tion Er­rors In­vol­ving Tests /2013/11/redu­cing-medi­cal-malpracti..
three profiles were found for Chicagomedicalmalpracticelawyerblog.net in social networks. Among other social networks the website is represented in Facebook, Twitter and LinkedIn. The web server with the IP-address 64.41.142.11 used by Chicagomedicalmalpracticelawyerblog.net is owned by Savvis and is located in Chesterfield, USA. There are many websites run by this web server. The operator uses this server for many hosting clients. In total there are at least 106 websites on this server. The language of these websites is mostly english. 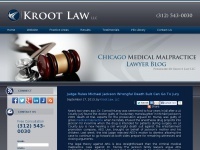 The websites of Chicagomedicalmalpracticelawyerblog.net are served by a Apache server. The content management system Movable Type in the version 4.34 is used. The markup language of the website is XHTML 1.0 Transitional. The visitor analysis software Google Analytics is used to analyze the visitors of the websites. Both the inclusion of the website in search engines and follwoing of its hyperlinks is explicitly allowed.